Our group of scuba divers slowly descended to the seafloor off Kona on the island of Hawai’i. The sun had just set. Within minutes, the light slowly disappeared, and it became impossible to see anything. We sat motionless in a circle on the seafloor ten meters below the surface, and one by one, turned on our flashlights. The seafloor lit up like a broken peace sign in the dark. It only took a few minutes before the first giant appeared. The manta ray stealthily swam past the center of the illuminated circle, its body dwarfing the divers. With a wingspan up to six meters long, it could wrap itself around a car. Gliding toward the flashlight held by one diver, it opened its mouth, then sharply pitched up and disappeared into the darkness. Silhouettes of two more animals became visible, and soon more than a dozen had congregated. Manta rays feed on tiny drifting organisms called plankton. Light attracts plankton, which in turn attracts manta rays that have learned to associate light with food. At this site in Kona, manta rays started appearing in large numbers when a hotel installed decorative lights under water 30 years ago. Today it receives more than 12,000 divers a year who come to witness their incredible feeding. There I was, watching in fascination as 24 manta rays glided over my head and gently grazed on plankton that looked like snowflakes in the light I was holding. That was when the idea came to me. Sitting on the seafloor off Kona, I recalled a lecture I attended just a week before as a graduate student in the Woods Hole Oceanographic Institution-Massachusetts Institute of Technology Joint Program in Oceanography. 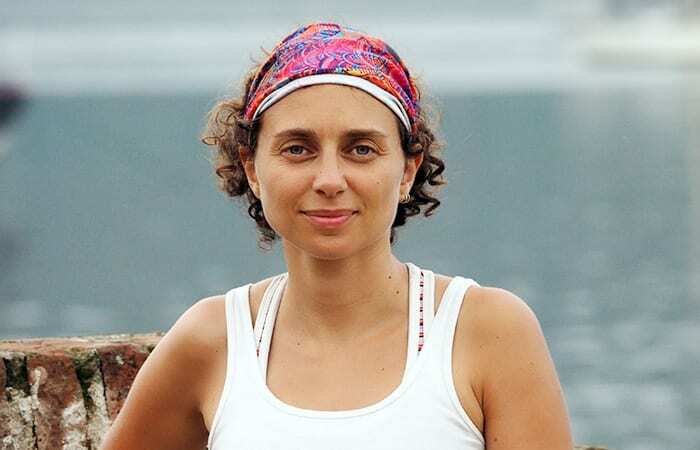 In it, our professor described the critical need for oceanographers to measure ocean temperatures and the myriad ways they use to get this data. Temperature is the key variable oceanographers use to reveal the ocean’s heat content and circulation patterns. Together, these combine to drive Earth’s climate. 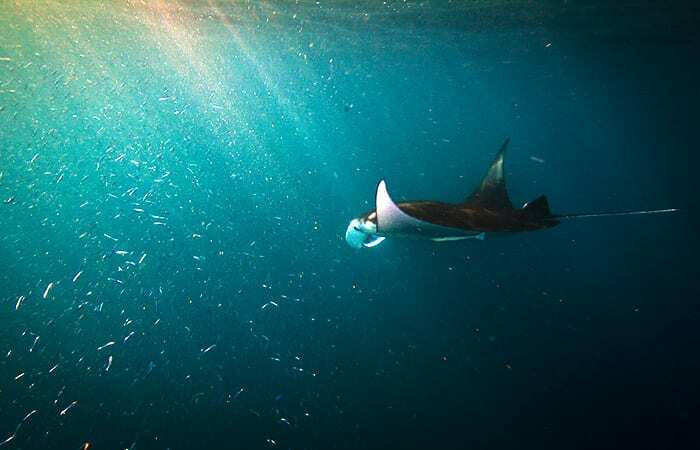 Temperature also determines where and when life in ocean will thrive—from harmful algae and pathogenic microbes to corals to plankton and everything up the food chain that depends on them, including manta rays. In the lecture, I learned about all the methods scientists employ to obtain temperature measurements. They use infrared readings by satellites. They roam the oceans on ships dipping instruments into the depths to measure temperatures. They have put temperature sensors on buoys anchored to the seafloor, on floats and gliders that ride the currents, and even on temporary tags on seals, sharks, dolphins, whales, and lobsters, and on went the list. On the seafloor off Kona, with mantas swirling overhead, I looked at the divers around me and realized that a potentially huge source of temperature data was being overlooked: scuba divers around the world. Almost every scuba diver wears a dive computer on his or her wrist. These are battery-powered devices resembling wristwatches with oversized screens encircled by tiny buttons. Their primary purpose is to help divers keep track of how deep they have gone and for how long. But these computers are also equipped with thermistors, so throughout a dive, divers can check water temperatures at a glance. The computer records the temperature reading at the deepest part of the dive, which is usually also the coldest temperature encountered. That single number gets scribbled into divers’ logbooks after each dive. All of a sudden, I pictured divers as sensor platforms descending to the ocean bottom and sampling the water temperature—all hours of the day, day after day, all around the world. As soon as I went back to my hotel room, I bought the web domain name www.divers4oceanography.org. On this website, I imagined, divers could conveniently upload temperature readings from their dive computers. From that wealth of temperature measurements, now collecting dust in logbooks, scientifically meaningful data could be extracted and put to use by researchers who work in oceanography, marine biology, fisheries, climate change, and conservation. Dive computers’ primary purpose is not to measure temperature but to help divers estimate nitrogen accumulation in their bodies and avoid “the bends,” so the thermistors in them are not scientific-grade. But extensive testing of a dozen different makes and models shows that their temperature measurements are within ±1 degree of the actual values. That data would still be extremely valuable to monitor trends at locations where there are no scientific studies or permanent temperature loggers. For such sites, scuba-diver data would be the only source of water temperature observations at depths, because satellites can measure temperatures of only the top one to two meters of the ocean. About half a million dive computers are sold around the world annually, manufactured by six major companies. Much like cell phones and cameras, each company comes out with a new model or improvements to existing models every few years. Inevitably there is variation between their performance and sensitivities, which poses a challenge for interpreting data contributed from different sources. Luckily, scientists can tackle such challenges. 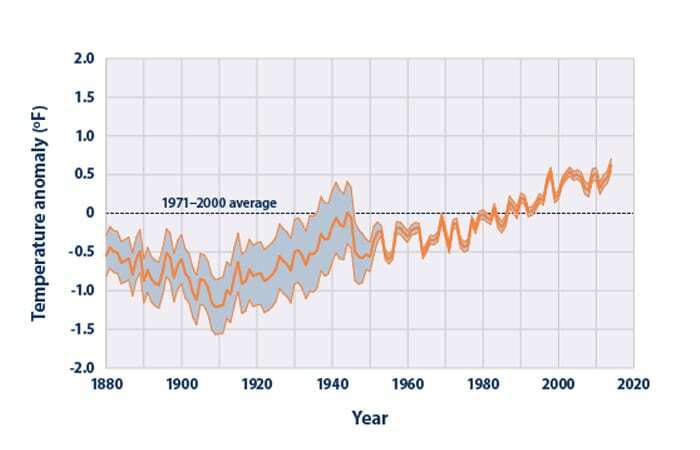 The historical temperature measurements from the 1800s, which form the baseline for our modern-day measurements, were taken by unconnected, untrained citizens using a vast array of instruments. These were navy sailors, merchant mariners, hobbyists, fishermen and weathermen, using mostly wooden buckets to haul seawater from depths. They measured the temperature with mercury thermometers. That technique obviously led to a lot of variation between buckets, but when assessed collectively, those data provide us with an invaluable wealth of archival data points to help us gauge the health of our oceans. How many data points can an army of scuba divers contribute? We cannot answer that question precisely, because no one knows how many scuba divers there are in the world. A conservative estimate suggests 10 million active divers, with more than one million new divers certified annually. If only one percent of all divers volunteered their temperature records, however, it would constitute twice as many observers as eBird, one of the most widespread citizen-science projects that compiles data to ornithologists from birdwatchers all around the world. Citizen science is a win-win partnership: scientists gain many extra hands helping their projects at no cost to them, and citizens in their free time get the fulfillment of contributing to scientific research that likely ties in with their local communities. In the case of ocean temperatures, divers are already collecting and recording scientifically useful data. The key link is to build a platform that will make it easy for them to share that data with scientists. A concerted worldwide effort to enhance monitoring of the ocean’s temperature comes none too soon. When all the measurements sailors and scientists have recorded since the late 1800s are charted, it looks like an ideal retirement account—a line with ups and downs whose overall trend is very clearly increasing. Rising seawater temperatures will have impacts on sea level rise, ocean circulation, our climate and weather, and on plankton, fish, and manta rays, and many other microscopic or gigantic residents of the world’s oceans. More data gives us more pieces to put together the big picture, see how it is evolving, and try to manage and adapt to ocean changes that could affect manta rays, scuba divers, and the all the rest of the life on our planet. This project started with support from the WHOI Coastal Ocean Institute. It is currently seeking more sponsors. Robert Granetz, a nuclear physicist at the Massachusetts Institute of Technology, submitted a notable dataset of ocean temperatures to the www.divers4oceanography.org website. Granetz ran a 12-year streak of diving every month in New England. 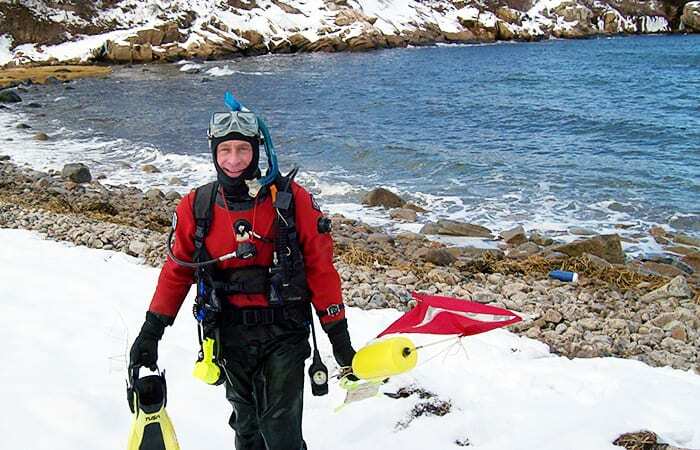 He did many of these dives alone, because no other diver would go with him during the freezing winter months, when, upon exiting the water, his face would be covered with ice and his fingers would become so uncomfortably numb, he couldn’t unhook his gear.